The thrill of the find centers around PETER THATCHER WASHBURN, a Vermont hero of the US Civil War, and late in life 33rd governor of the state. Read all about the marriage ledger and Washburn at the United Church of Ludlow (scroll down to the story “Historic Record of Vermont Civil War Hero and Governor Discovered”). My friend Calista and her husband Francis recently journeyed to Derbyshire to visit Renishaw Hall. Renishaw Hall served as Pemberley in the BBC’s 1980 production of Pride and Prejudice starring Elizabeth Garvey and David Rintoul. Calista and I love this version; for me, it’s due to the authenticity of Fay Weldon’s screenplay. In the photo above, you witness the arrival of Miss Eliza Bennet and the Gardiners. “Went to Renishaw Hall around 11 yesterday. First, we explored the gardens, since the guided tour to the house for which I had made reservations began at 12:30. “You know last night I rewatched the part where Elizabeth visits Pemberley. The gardens haven’t changed drastically. I am guessing the lake scene must be from somewhere else since the lake in front of the Renishaw Hall didn’t look anything like what was shown on the series. That part of the lake is blocked off from the edge of the gardens, so no way to walk towards the lake. Aren’t these DETAILS simply gorgeous? Such well-preserved gowns are so wonderful to see. The woman German World magazine called “the ‘Lady Diana’ of the 19th century“, was born Duchess Luise Auguste Wilhelmine Amalie of Mecklenburg-Strelitz — niece to Britain’s Queen Charlotte. 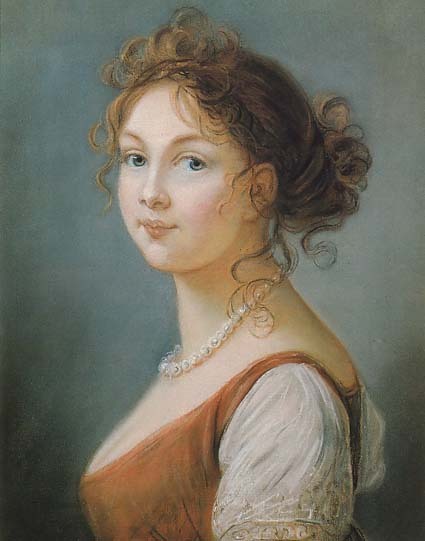 Queen Luise would not live to see the end of the Napoleonic Wars; she died in July 1810 – aged only 35. Her husband, Frederick Wilhelm III of Prussia Mary Gosling would mention in her earliest (1814) diary. Read more and See more Königin Luise via google. It’s always a thrill for me, someone in “mid-life”, to remember that others have trod the same path before me: Working on our life’s work out of pleasure, if nothing else. And that says a lot about Mrs Delany and her flowers – two of which you see depicted on this book’s covers. I must comment that it was the inclusion of MRS DELANY’s name on the cover that made me stop and look… That, especially, should NOT have gone by the wayside in any redesign…. Molly Peacock describes in her online chapter what it might have been like, sitting by Mrs Delany as she scored and snipped. Made from paper, her “flower mosaicks” look gloriously realistic. Why did this title intrigue me? I’ve never forgotten reading, in The Story of the Trapp Family Singers, its author (Maria Augusta Trapp) telling a tale about grasping a bell pull to give its bell a ring and shouting out that she wanted to be an author after age 40. Then she was asked if she knew the legend of the bell. No, she said… This spoke to me even before I was 40! This is an exhibition catalogue; you can view more of Mrs Delany’s work at the British Museum. And the “classic” biography is a must-get. To READ Mrs Delany’s own words, see my prior post about Mrs Delany’s Letters. Readers of Two Teens in the Time of Austen will know of my fascination with letters, diaries, and their resultant publications (which certainly save perusers’ eyesight). In “email-conversation” with Calista a few weeks ago, we got to discussing travel guides and I mentioned those published by Murray – because I remembered it being used in The Ruskins in Normandy: Tour in 1848 with Murray’s Handbook. So tonight, when looking around Internet Archive, I thought to see what they had for these travel guides. They were published too late for the travels undertaken by Mary, Charles, Drummond Smith – but I’m sure other members of the family knew of them, perhaps even used them. I had to post this title page illustration for Murray’s 1851 handbook to “Modern” London – and I invite you to read about the city by following this link: Modern London, Or London as it is. Akkk! Murray’s writes of Portland Place as “a wide monotonous street” – Mrs Smith and Mr Gosling would not be pleased…. Page 32 describes Regent’s Park, a destination Mary mentions often. They loved the Zoological Gardens, visiting often each season. Page 264 discusses “Langham-place Church” – which was New Church when Mary and Charles married in 1826. A listing of Murray’s English and Continental Handbooks are found at the end of the book. I must admit that – lookswise – this is not my favorite piece at this 2007 Christie’s auction, but if it once held the clothing of Elizabeth (née Gosling) or Langham Christie, then it holds special place in my heart. It’s a large piece: 93 1/2 high x 55 1/2 wide x 22 3/4 deep. Mary’s elder sister, Elizabeth Gosling was born in 1798. In Mary’s diaries Elizabeth is NEVER named; she is only ever “My Sister“. Mrs Smith confesses in a letter that she had seen the romance blossoming, and she for one wasn’t surprised when Langham Christie proposed! The couple married in the summer of 1829. Although Langham eventually inherited Glyndebourne, the couple made their home at Preston Deanery. Their son, William Langham Christie, began the Christie inhabitation of the future “opera-loving” estate. Found this on Pinterest – and then hunted up a place to get it. Check out The Literary Gift Company – £12. Jane Austen seems to reside in Gloucestershire more than Hampshire. Oh, well; can you find her? 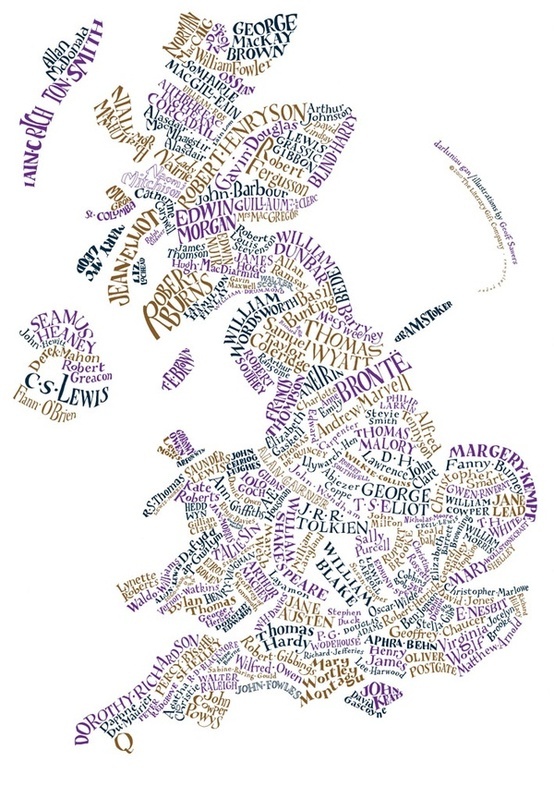 Who on the “map” is your favorite writer? Who is missing?? It’s claimed there’s 188 writers here… Happy Hunting — and reading! Yes, “my” family has OLYMPIC Gold in its past. As a member of the Upton Park Football Club, William Sullivan Gosling (1869-1952) competed at the Paris Games in 1900 – and walked away with a Gold Medal!